The title of this post is common community FI phraseology. I hear it often, and use it often. My epiphany came when I performed research for a client that subscribed to the Return on Equity school of thinking. 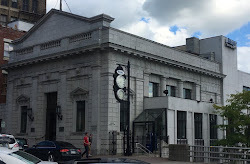 This FI had a high percentage of funding coming from CD's and FHLB borrowings, a relatively low loan to deposit ratio, and focused on generating profits within the investment portfolio. The FI performed very well on an ROE basis. Its relatively low net interest margin, due to high funding costs and low yield on earning assets, was more than offset by very low operating costs. The FIs CEO lamented at his low trading multiples. I decided to dig into why his multiples were so low. It turned out that the best indicator for trading at high multiples was a low cost of deposits. I performed this research about ten years ago. Dial forward to today and I decided to test again if the cost of deposits as value driver is still true. The results are in the table below. I searched for profitable banks & thrifts with at least 1,000 daily trading volume that had non-performing assets to assets less than 3%. The search yielded 101 banks and 30 thrifts. Not a large number but in order to get reasonable values I had to control for inefficient trading and asset quality. Banks in the top quartile (best) cost of deposits traded at a 17.4% premium to bottom quartile performers in price to earnings multiples and a 35.5% premium in price to tangible book multiples. 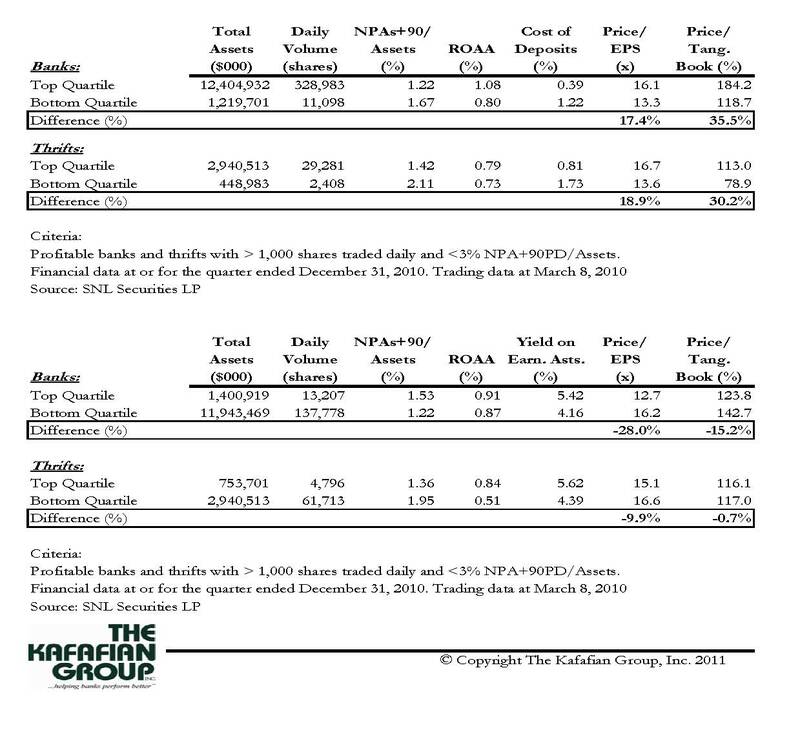 Thrifts top quartile performers traded at an 18.9% and 30.2% premium on price to earnings and price to tangible book, respectively. But could this be relating to their margin or yield on earning assets? I tested for yield on earning assets and the answer was no, there was no positive correlation between trading multiples and yield on earning assets. There are imperfections to this analysis, though. Upon review, larger banks with greater trading volume also trade at higher multiples. This is probably the result of a greater pool of institutional investors due to volume requirements. Additionally, although trading multiples are beginning to show signs of improving, the overall trading of the banking sector has not returned to normal. 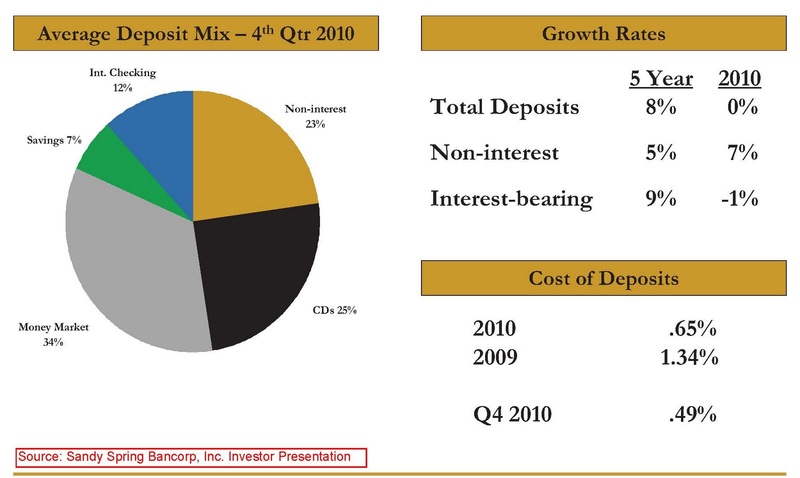 But ten years ago my analysis demonstrated that FIs with better deposit mixes and therefore lower cost of deposits enjoyed greater valuations. And today, the results are very similar. So why do so many FIs doggedly stick to asset-based business strategies? Some, such as Sandy Spring Bancorp (see slide below), have been generating value from the liability side of their balance sheet and continue to do so. According to Sandy Spring's latest investor presentation, the bank pursues a "strategic focus on small business, middle market and affluent retail customer relationships". Anecdotally, most small and mid-sized businesses do not borrow. So serving them, one would think, would require a focus on deposit relationships. It appears as though Sandy Spring is winning, having 23% of their deposits in non-interest bearing DDAs and a cost of deposits of 0.49% in the fourth quarter. They trade at a 16.2x earnings multiple and at 130% of tangible book. It should be noted that Sandy Spring is headquartered in Maryland, a state that has experienced its fair share of credit challenges, hence the relatively low price to tangible book multiple from other top quartile banks. Do you believe core deposits drive value? If so, why, and if not, why not? Disclosure: My company has served as a strategic advisor to Sandy Spring within the past twelve months. The "gas" that allows the car to travel...Makes sense! - The sample size is likely skewed and likely not statistically significant. The data used to generate results covered 131 FIs (101 Banks and 30 Thrifts) out of the total population of nearly 7,700 Banks. Because you were looking for market prices, most of the FIs are likely larger than average, given that overall, very few of the 7,700 Banks are publically traded and/or have any meaningful liquidity in their stock. 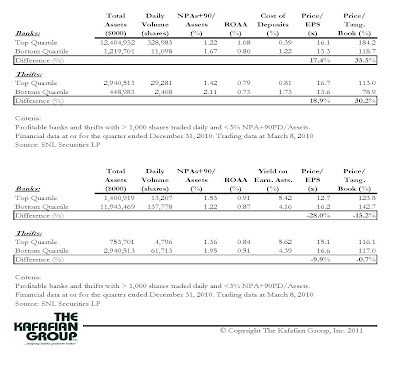 - The analysis implicitly assumes that only two (2) factors influence PE ratios – COF and Yield on Earning Assets. This is, of course, incorrect and thus any conclusions are, therefore, subject to grave concern. - In the end, it is not clear that the thesis was actually proved – that is that Core Deposits drive value. At best, you make the point that low COF may have a causal relationship to higher PE and P/B ratios. However, as indicated above, the analysis did not keep all other things constant, thus, these findings are highly speculative. This would be a very interesting analysis to perform but the analysis is not trivial and requires more than a 'back of the envelope' effort. Serge I understand your concerns about the data set. Controlling for profitability, asset quality, and trading liquidity limits the pool of banks/thrifts measured, particularly in this environment. Eighty percent of community banks revenue comes from spread, and there are only two data points to spread, yield and cost. I focused on those two, and found little correlation to trading multiples on one, and a stronger correlation on the other. Flawed, yes. But I've seen strategic decisions made on dicier data, such as entering a balance sheet leverage program using pre-payment speed assumptions that did not contemplate a falling rate environment, or consultants running around saying the branch is dead. Jeff - As you know correlation is not the same as causation. That is, just because two factors appear to be correlated, does not necessarily mean that one causes the other. In this case, it is not a foregone conclusion that low COF causes high PE and P/B ratios. This is critical, because many in the Banking industry seem to hold the title of your post as gospel. I disagree. I believe that what is important is developing a business model that generates strong and consistent returns with robust growth. Core deposits are part of the overall model, but they are certainly not the central actor that determines value creation. In fact, based on my experience from prior life, value creation - as measured by Total Return to Shareholders (TRS) is isolated into 4 components - market returns, industry returns, interest rate impact and management contribution. Clearly, managmeent can claim credit for only the last component. The management contribution to returns, can then be dissected into value drivers, which include NIM as you indicate but there is also the impact of Fee Income (which is substantial for some of the larger Community Banks and Regional Banks), the overall opportunity as defined by the Bank's footprint (physical and virtual), pricing power, customer profitability, etc.. Sorry the above comment just posted today. It was caught in my "spam" comments. Not sure why. But it is an important one to the dialogue. I'm not sure you and I are going to agree on this one. Common ground may be: the relationship management component could very well result in lower cost of funds, as FIs focus on customers that are willing to bring significant pieces of their business to the bank.